1st July 2018 Apologies to anyone who has attempted to contact me on my landline. It appears that the answerphone function has not been working for at least the last ten days. New phone fitted today so normal business resumed. Any problems please phone me on my mobile number 07749 650220. 1st July 2018 Due to the current very dry weather there is a lack of obvious mole activity at the moment in the Devon/ South Hams area of the country. The main reason for this is that as the ground dries out the worms, that are the mainstay of the moles diet, moved deeper into the damper earth below the hard surface earth. The result of this is that the moles either use existing tunnels further below the surface or dig new ones and compact the earth to the side of the new tunnels wherever possible. 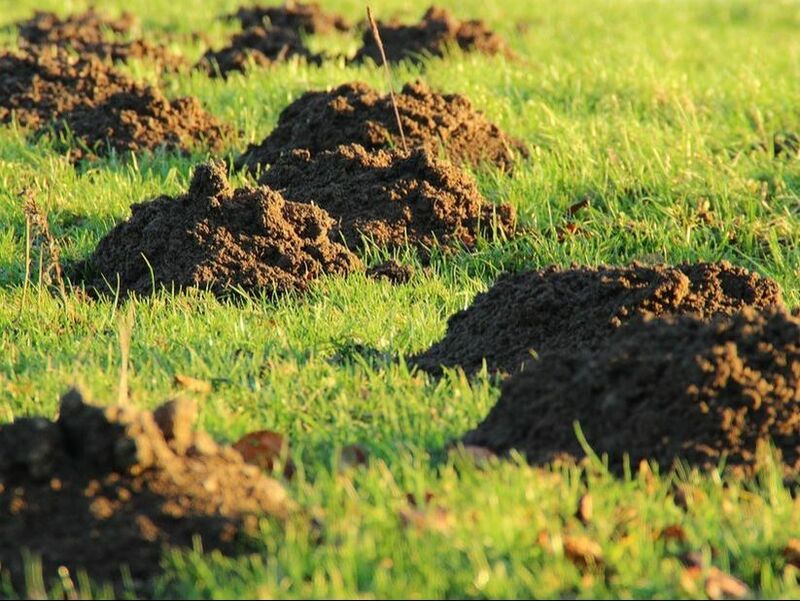 This means that there are far fewer mole hills appearing in gardens and fields. When the weather changes i.e cools down and becomes damper the mole activity will become more apparent. 27th July 2018 The weather is still very hot and the ground is parched. Today we have had some rain for the first time in nearly a month. It won't be enough to soften the earth up but if we get more rain, as promised, during the weekend then as the earth softens the worms will start to come closer to the surface, closely followed by the moles and molehills will start to reappear as the moles hunt closer to the surface. 13th August 2018 The South Hams area has had three days of rain, some of it very heavy, and traces of mole activity are beginning to show. As the worms begin to come up closer to the surface in the , now, moister and softer soil, the moles are following. Mole hills and small 'push ups' are becoming apparent for the first time in a number of weeks. If we get more rain over the next week then the moles will become more obvious. If not, and the ground hardens up, their obvious activity will become difficult to spot. They won't stop working but will be much deeper underground chasing worms and other food. 14th September 2018. As the weather is cooling down and we are finally getting a small amount of rain and some early morning dew the mole activity is starting to become more apparent. The worms are coming closer to the surface as the ground is getting damper and more soft. The result of this is the moles are also working the ground closer to the surface and leaving their tell tale mole hills and small surface soil pushups. These push ups manifest them selves in areas of turf being raised, as the moles travel very close to the surface. As the Autumn sets in we will be seeing even more activity from them. 16th October 2018. The weather has changed considerably in the last two weeks. As the nights draw in the temperatures are dropping. Autumn is definitely on its way. The South West is receiving far more rain than it has for the last few months, added to this the early morning dew's and the ground is suddenly becoming much damper and softer. As this happens the worms move closer to the surface and are followed by the moles. The result of all this change is the sudden appearance of large numbers of mole hills in gardens, farms, caravan sites and golf courses. 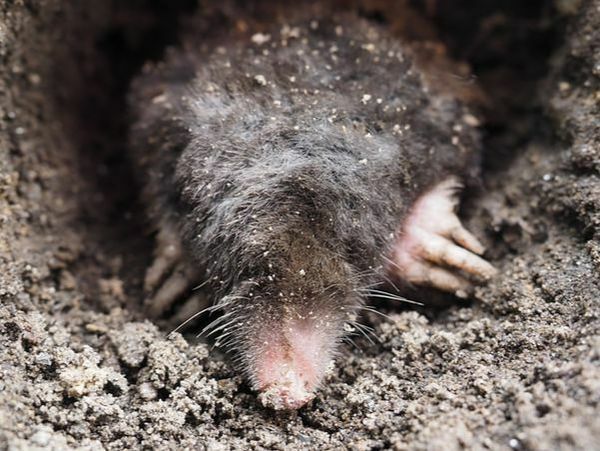 It is best to catch the mole or moles that are causing the damage as soon as possible , left to their own devices they will happily tunnel away, and create large numbers of molehills. I attended a small garden earlier this year that looked like a mountain range as there were in excess of 35 molehills. All of these molehills were caused by just one mole. Once I caught him the distraught householder was able to tidy up the mess. If you do have a problem with moles please call a mole catcher as soon as it starts, and get some advice and take action. But please do not rely on any of the gadgets on the market, such as windmills and other like items, as they do not generally help with mole removal. The old fashioned way is best, Just call a mole catcher ! 15th November 2018. Winter is definitely on it's way. Temperatures are dropping, although the ground is still warm for this time of year. The morning dew's and rainfall we have been having has made earth moving much easier for the moles, and molehills are appearing in farms, gardens, caravan sites and on roadsides all over the South Hams. Currently I am working in a large orchard that has a river one side of it and a small stream running down the other. The owners have decided that enough is enough and that the moles have to go. There was evidence of many old molehills and a large number of new ones , the owners were worried that there might be quite a few moles at work. So far I have removed eight moles which is probably all of those in the orchard. As I have mentioned before the number of molehills does not equate in any way to the number of moles. If you are not sure if what you see is actually mole activity call a molecatcher he will advise you if it is either historic activity or if in fact it actually is evidence of a mole currently being present. Small creatures such as mice and voles will often take up residence in mole runs once they have been vacated by their original owner. If you come across a mole run that is open to the air then there is not going to be a mole present , if he was the hole would be quickly blocked.The holes are used by smaller creatures entering and leaving the old mole runs. If you notice worn edges around the holes where the grass has been worn down or away its due to small animals entering and leaving. If in doubt call a molecatcher. 2nd December 2018 It's been a strange start to the winter for moles. There does seem to have suddenly become a lot less mole activity than there was earlier this month. During the long hot summer I did find a number of dead moles on the surface. It is likely that as they were young moles they had come to the surface as they weren't experienced enough to go as deep as the worms had in the hard ground and had come to the surface to forage for food and having been unable to find enough had starved to death. This may well account for the lack of mole activity as if I found dead moles there would obviously have been many more, so the mole population in the area may have been drastically reduced. The other possibility may be that the moles have started breeding early which would mean that the pups are likely to appear in February or March of next year. I will, as usual, be out and about and am always happy to offer help and advice if anyone has a problem with moles on their land. 25th December 2018 Just a quick message to any visitors to my site Happy Christmas to you all from the South Hams Molecatcher. 19th January 2019. Mole activity in the South Hams is becoming more noticeable by the day. I am receiving regular calls asking for advice and help from people who are having mole problems. I am always happy to give advice to anyone. Advice is free, just contact me and, I will help if I possibly can. One piece of advice I always offer is, that the only way you can truly be sure of dealing with a mole problem is by using a molecatcher. There are many gadgets on the market that claim to scare moles away from gardens but I have not found one so far that actually works. Similarly catching moles and releasing them at another location is a) not practicable and b) In breach of the Wildlife Act, so for those two reasons are not a course of action open to a molecatcher. 14th February 2019 The weather in the South Hams area has been mild for the time of year. The ground is soft and the moles are as ever active. As the daylight hours get longer people are starting to spend more time in their gardens tidying them up for the onset of Spring which is hopefully not to far away. Fingers crossed we don't get another 'Beast from the East' like we did last year. I am receiving more and more requests for help from farmers, gardeners, caravan site owners and in fact anyone who has grassed areas that need to be mole free for whatever reason. If you need any help or advice with a mole problem please give me a call. 15th February 2019 There are a number of reviews about my work within the website and its always nice to receive them. I recently carried out some work for Helen in Wembury who emailed me the following. 1st March 2019 Up until the last two weeks the moles have been very active. Suddenly there has been a marked decrease in any obvious signs of them. I have been asked why this is by a number of people. The reason is simple, the moles are focusing all their activity on finding partners to breed with. Unusually, probably after the difficult time they had with the weather last year, they all seem to have chosen roughly the same time to mate. I predict (always a dangerous thing to do where Mother Nature is involved), that by mid April there will be a sudden increase in mole activity as all the new mole pups leave their mothers and look for territory of their own to hunt in. 20th April 2019 I am starting to notice that smaller, younger moles are becoming more apparent than they have been for some time. This trend means that a new generation of mole pups have left the nest and are now looking for territory of their own to live in. 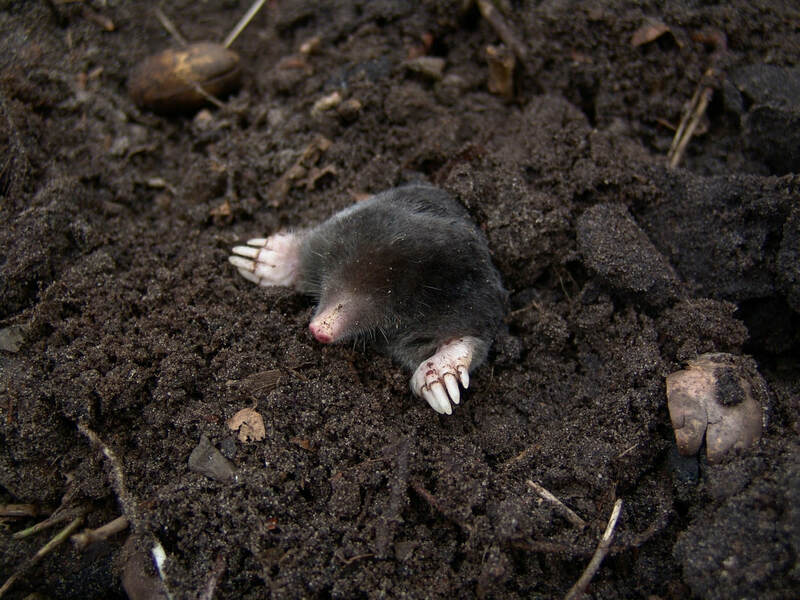 This means that currently mole free areas that are able to offer enough food and water for a mole to survive in are likely to show signs of new mole activity. Additionally, areas that have historically had moles living in them and are currently mole free, may become re-inhabited by a new mole or moles if they are large areas.